Salt Lake City, UT – January 30, 2014 – Monnit Corporation (www.monnit.com), a leading provider of wireless monitoring and sensing solutions for commercial and industrial clients, today announced the establishment of its Global Services division. The new division provides development services for partners wishing to create new monitoring solutions or modify any or all of Monnit’s existing, proven, award winning platform. The development services are offered to partners, OEMs and direct customers. Monnit currently has over 40 different sensor types and robust, reliable gateways available on various platforms. However, certain applications can sometimes fall outside of common uses. Monnit’s Global Services team works with partners to develop wireless sensor and monitoring products that meet the needs for their specific application. Monnit Global Services team also provides testing, manufacturing, technical support and training to ensure that only the best results are achieved. OEM’s and integrators will be especially interested in these services as Monnit continues to encourage and offer complete private labeling of custom and existing solutions through the OEMSensors.com brand. For more information on Monnit’s Global Services, call (801) 561-5555 or visit www.monnit.com/global-services. OEMSensors.com, a division of Monnit Corp., brings an award winning, fully tested, FCC, CE and IC compliant wireless sensors platform to those wishing for a completely brandable sensors and monitoring solution that can be easily integrated into existing systems, products and services. Monnit wireless voltage detection sensors connect directly to high voltage power sources. Because it is not isolated, any exposed metal around the wiring and antenna must be treated as “HOT”. To prevent the possibility of electric shock, it is recommended to mount sensor, connect wiring, and orient antenna prior to energizing the AC source it will be monitoring. Water intrusion can start small and remain un-noticed for some time. Even the smallest amount of water can ruin property as well as seep into walls and flooring causing structural damage and/or mold. There are numerous sources for water intrusion and with the winter months upon us, we can start to see fluctuations in temperatures which can cause a multitude of these issues. Roof leaks (both from age/wear and from snow and ice damaging roofing materials). Plumbing leaks and/or pipe breaks in colder weather. Flooding from outside of the building. Moisture intrusion through the building envelope. Monnit provides a low-cost, reliable, wireless monitoring solution that provides immediate notification of water presence as well as monitor for variables that can lead to water intrusion. Water Detection Sensors Detect and notify at the immediate presence of water. Temperature Sensors Monitor temperatures and notify if below or above set threshold. Water Temperature Sensors Monitor temperatures in water storage tanks and notify if too cold. Voltage Detection Sensors Can detect if a sump pump is activated due to water level in sump pit. 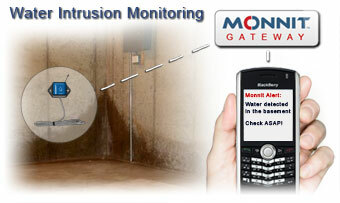 Keep your property safe and water damage free by using Monnit wireless sensors.